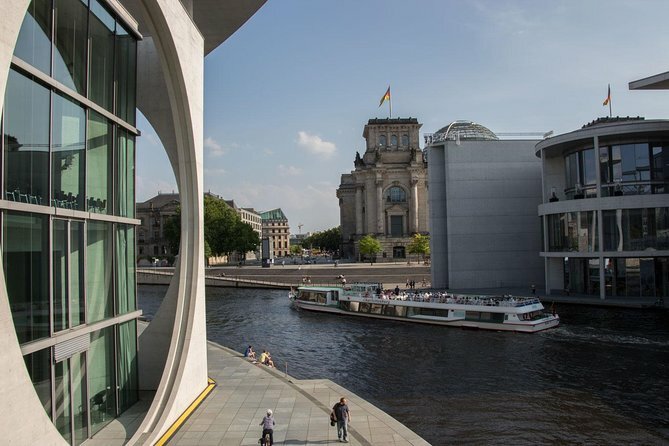 Explore Berlin with this 1-hour cruise going past all of main sights, including a piece of cake and a hot drink of your choice. With this cruise you have the unique chance to see the countless modern and historical attractions our city has to offer from a completely new perspective - and hear about their history in both English and German. Even on the hottest days of the year the light breeze acts as a natural air conditioner, providing a pleasant refreshment from the beginning till the end of your journey. Explore the beauty of Berlin with this wonderful cruise with one of our premium-class boats including a piece of cake and a hot drink. English and German commentary from the speakers on board will provided while visiting the; Museum Island, Berlin Cathedral, Berlin City Palace, TV Tower ,Red Town Hall, Nikolaiviertel, Reichstag, Government District, Main Train Station Hauptbahnhof (the main train station), German Chancellery and House of the Cultures of the World. The ticket includes one piece of cake of the day and one cup of hot chocolate, coffee or tea. Each participant can choose their drink directly on board of the boat.